The day after we moved into our new house, I came across an envelope filled with memories tucked into one of the cartons we’d placed in storage several years before. Inside the envelope, I found pictures of my wife Carol and me with a man I idolized as a boy and had the extraordinary pleasure and thrill of spending time with as a man. Only three days later, the national news media broadcast to the world that Roy Rogers, the man in the pictures with us, had passed away. Roy was born as Leonard Slye in Cincinnati, but his family moved upriver to Portsmouth, Ohio, when he was seven. A generation later, I was that same age when my own family moved to Portsmouth. Like every other kid growing up in a small town back then, I spent my Saturdays at the movie theatre watching my cowboy heroes. I had many heroes then. Lash LaRue, Hopalong Cassidy, Rocky Lane and Red Ryder to name a few, but Roy Rogers was King of the Cowboys. The screams were louder when his movies started. Maybe he was our favorite because he rode that big golden stallion or because he always wore a white hat and made it the symbol for the good guys. It didn’t matter that the hat never came off no matter how fast he rode or that his six-gun never ran out of bullets. Somehow we knew the others were actors but Roy was real. Somehow we knew that if the bad guys rode into our town, he would come. He was a small town boy who grew up to be a cowboy. King of the Cowboys. That was our dream in those days. To be just like Roy when we grew up. We eventually had to grow up, of course, and our dreams changed. Spending Saturdays with our heroes became a memory stored away and all but forgotten with other childhood fantasies. Forgotten until many years later when I received a phone call from our next door neighbor. “Earl,” Helen began, “we need volunteers for the Bicentennial Parade this weekend. Would you be available?” Helen headed up the Chamber of Commerce of Carroll County, Maryland, where we lived at the time. She interrupted my string of excuses. “Roy Rogers will be there,” she said. “You’re kidding,” I think I said. I may have fainted – I don’t remember – but apparently, I said something like, “Where do you want me, what time, and what do I have to do?” I got the job. My job was to ride a moped up and down the parade route to keep people out of the street and out of the way of the vehicles. A Moped Cowboy, as it were. I don’t know how many people were run over that day because I rode right beside the convertible carrying the King of the Cowboys. I never took my eyes off him. He wore the white hat, of course, and the cowboy suit. No six-guns, but the squinting smile and the twinkling eyes were the same as he rode along and waved to the crowd. He may have been 73 years old, but I saw the eternally young Roy of my childhood Saturday movie marathons. The red convertible was the great golden stallion, the store fronts along the parade route were the hills of the Old West. He was still King of the Cowboys and I was his sidekick. That evening, I barely remember getting dressed and going to the reception. I remember as though it were yesterday the events that followed. He was clearly enjoying himself. He came across as a small town boy, visiting old friends in a small town like the one he and I grew up in. He sang songs everyone remembered in that crystal-clear voice that seemed ageless. He gave white Stetsons to a select few local officials. I wasn’t one of the lucky ones. When he asked if anyone had any questions, my hand shot up in the crowd. I asked if he still yodeled. Most people didn’t remember that he was the best of the country western yodelers. He laughed and gave us a demonstration, but only after telling a story about an old hound dog he once had. The dog liked to yodel along with him. He thought they made a good team, he said, but Dale wasn’t impressed. She threatened to shoot them both if they didn’t take it outside. He closed by singing “Happy Trails,” the song he and Dale wrote and which became their theme song. Later, when I managed to maneuver into a spot right beside him, I introduced myself and told him we’d grown up in the same small town. His eyes lit up and we talked for a while. We talked about barefoot-boy days, about swimming in the creek anytime we wanted to, about following our fathers’ plows through the field, breaking up clods with our feet, and about slurping red ripe tomatoes fresh off the vine. 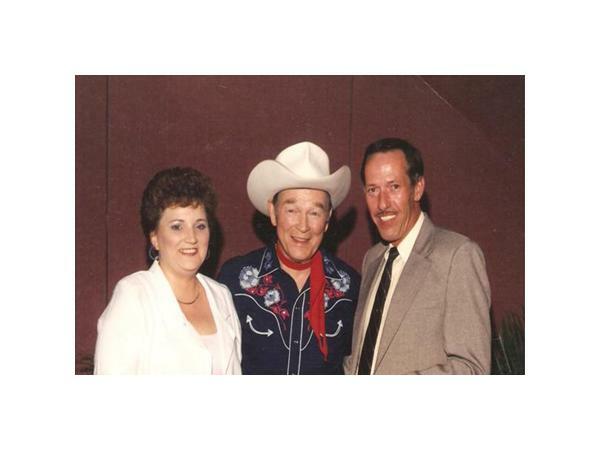 We had pictures taken of Carol and me with the King of the Cowboys himself. Roy even let me try on his white Stetson. It’s funny how finding old pictures can take you back. I hope this story doesn’t sound maudlin or like an old fool waxing sentimental about childhood memories and heroes. I’m much too mature and sensible for that. I just came across some old pictures and was remembering, that’s all. But just imagine. Me. Wearing Roy’s white hat. Oh, cool. Great post, Earl. The very first book I bought by saving my allowance – I think it was fifty cents a week – was Dale’s “Angel Unaware.” Wow (I remember thinking), my very own book. Not a birthday present. Not a Christmas or Chanukah present. Mine! All mine! I asked the bokstore owner to wrap it. “What kind of wrapping paper do you want?” he said. “Something with love on it,” I said. I shook my red, Shirley Temple curls. “Just love,” I said. Deni, I can picture you shaking your Shirley Temple curls. Your story is spot on because Dale’s book was about love of the deepest kind. Best to you, my friend. I wanted to own Trigger so bad! I saw Trigger in person, on stage when I was a little girl! It was a highlight! Roy and Dale were there, but I had eyes only for Trigger. That horse walked all the way across the stage on his hind legs, with a saddle on his back. What a horse! Deni, I had that book, too. I’d forgotten all about it, though, until I read this just now. I did see Roy, years later, at a baseball game in Cincinnati. I was many rows behind him, but you could tell it was him. I loved that horse, too, Kaye, and was mad at Roy when he had the magnificent stallion stuffed. Trigger deserved a respectable burial and memorial site. How sad that he was sold at auction when they closed Roy’s museum. But, in spite of all that, we still have the memories. Great seeing you in Georgetown, Kaye. I hope you sold a jillion books. Olivia DeHavilland rode him in the Errol Flynn movie, “The Adventures of Robin Hood.” His original name was Golden Cloud at the time. Then Roy came along, his name was changed to Trigger, and the rest is horsestory. A terrific reminiscence, Earl, about a man who was one of my own childhood favorites/heroes, along with William Boyd as Hopalong Cassidy and Larry “Buster” Crabbe as Flash Gordon. Here in the Philadelphia area, a local TV station for a few years ran the “Roy Rogers/Gene Autry Theater” from 4 to 5 or 5 to 6–I don’t remember which–every afternoon Monday through Friday, alternating films starring each of them. I was never a big Autry fan, but I lived for the Roy Rogers films–and I still enjoy them now and then. In fact, when Turner Classic Movies ran a marathon of Roy’s films a few years back, it revived my passion for westerns. I can certainly understand how meeting him was a thrill and an indelible memory. It was an incredible experience, Barry, and will always be a highlight of my life. I enjoy the old cowboy movies as you do. They certainly didn’t portray the old west as it really was, but they gave us romanticized fantasy for entertainment. The bad guys went down with a one-two punch or a quick draw shot from a Colt .45, and the good guys saddled up and rode out of town. From those days, I grew up to love the John Wayne/Clint Eastwood westerns. They can have their X-Men, their Matrix, their Star Trek, even their vampires if they want. I’ll tale a good old western any day. Earl, what a wonderful experience meeting Dale and Roy must have been. I can certainly see why you cherish it. Dale and Roy set such good examples for kids encouraging them to be honest, good Christian folk. our world lost so much in their examples. It was an unforgettable day, Coco. And you’re right. We need more role models and heroes like Roy and Dale who made positive contrbutions to society young and old. BTW, my wife and I have been to New Port Richey many times. Her aunt and uncle owned a restaurant/nightclub there called Arnie’s Place. There’s also a restaurant in Tarpon Springs amid the sponge shops that serves the best steamed shrimp in the world. Dale Evans spoke at our church for our 75th anniversary. She was a joy to hear. My mom and another woman picked her up at the airport in Tulsa. The other woman (a retired teacher) was very disappointed in Dale because when she arrived, she was chewing gum. LOL. We had some wonderful heroes, didn’t we? I wonder who the kids idolize these days? Question: Did they stuff Buttermilk, too? Susan, Roy’s son Dusty was with him but not Dale. I’d love to have met her, too. I’ve never heard anything about stuffing Buttermilk, only Trigger and Bullet. Nowadays. kids idolize rock stars and athletes with much worse habits than chewing gum, I’m afraid. Role models are not what they used to be. Too bad. Thanks for stopping by. Earl, Roy was one of my heroes too – I could never decide who I loved best, Roy or Dale (and don’t even mention Trigger) – I’m glad you mentioned the yodeling – he was the best ever at that – and many people don’t know, but he really was a champion horseman and a true sharpshooter. Yes, we had a different breed of heroes in those days, But I’m kind of glad to be a dinosaur. I think today’s kids got cheated of a lot of the magic. Victor, I think we dinosaurs had the best of it when it comes to role models. Nowadays, young people flock to those with body piercing, tattoos, torn jeans, and little genuine talent to speak of. I dunno, Victor and Earl. Just when I despair of the taste in music today. Justin Bieber performs “Let it Be” with, no less, Carlos Santana on New Year’s Eve. Restores my faith in a whole generation. The little kid can sing AND play piano. AND mesh with the great Santana. Kaye, we’re on the same page here. Bieber is an exception. He’s well-dressed, well-groomed, well-mannered and has actual talent as a performer. That makes him a good role model. My despair is with those who don’t qualify in any of those categories and project the wrong image to young people. He sounds like he was a charming man. I’m so glad you got to meet him. I guess that will always be the highlight of your life. It certainly was an indelible highlight, Madeleine, one I’ll never forget. He was indeed a charming man who seemed to enjoy mingling with us as much as we did with him. I remember this story, and love it! BTW–you weren’t bad looking in that photo–and Carol looks gorgeous! Well, I have to admit Carol’s kept her looks. Me, I’ve aged a tad. Thanks for loving it, Sylvia. It was a special day for me. Well better late than never, Earl! I just got around to reading your story and LOVED it! Roy Rogers was also my favorite growing up. I collected Roy Rogers trinkets and pretended to be Dale Evans when I was about 10 years old. One time when he was at the Fat Stock Show in Fort Worth, he and his party came to the restaurant where my mother was waitressing (no, it wasn’t The Paris Coffee Shop!) Anyway, my mom got to wait on his group, and as bad luck would have it, she spilled some coffee on him. She said he was SO gracious and nice about it. She was humiliated, of course. But both he and Dale gave her an autographs for me! I was in seventh heaven! Hi, Pat! Looks like we both have special memories of Roy. I’ll never forget the time I had with him. Thanks for stopping by and don’t forget our breakfast date next time you come to Fort Worth. Best wishes for a wonderful Holiday Season and let’s make the New Year the best one ever. Roy Rogers Roundup.. I’m a huge Royand Dale fan. It’s a great group ful of good people.. Please join would live to have you!! Thanks to Sue Davis sharing your story in our Roy Rogers group, I just got to read & enjoy it completely. Have many great memories also of Roy & Dale on the silver screen, and over the years have managed to collect all of his movies. I still enjoy all the old “B” westerns, dated thou they may be. Like you said, there are no real hero’s for our kids (& grandkids) to look up to now. I also recently got back from the annual Western Film Fair in Winston-Salem, N.C. (July 6 thru 9), where we watched more old cowboy movies & serials, checked out all the great stuff the dealers had mostly all related to westerns, including movies, posters, books, etc. We also had some of the movie stars there selling pictures & signing autographs. A great time for anyone interested in reliving these great memories we all shared.